There is also a VoIP phone line in the WiFi-enabled common area by the pool that can be used to make free outbound calls anywhere in Canada and the USA at anytime of day or night, providing the complimentary internet service is working (no guarantee of 100% ‘uptime’ in Mexico, but it usually exceeds 95%!) For longer-term guests, it's easy to get a local pay-as-you-go cell phone for about $25, including 100 minutes of air-time, and you can then refill minutes at the local corner store. Click here for: DETAILED USD RATES FOR EACH SEASON. Our signature 2-Bedroom suites rent from $109 per night / $763 per week / $1,999 per month in the low season to $142 per night / $994 per week / $3,640 per month in prime season. Single Rooms from $49 per night / $343 per week low season to $69 per night / $483 per week high season. Double Rooms from $72 per night / $504 per week low season to $99 per night / $683 per week high season. 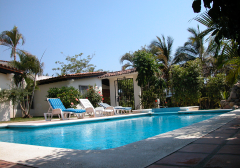 3 Bdrm/3 Bath Private Villa from $142 per night / $994 per week low season to $249 night / $1,743 per week high season. As our name suggests, Canadian Himalayan Expeditions Ltd., primarily specializes in extended adventures in the Himalayas of Nepal, India and Bhutan, as well as the occasional safari in Africa or climbing expedition in the Andes of South America. However, over the 25+ years we have been in business, many of our clients have told us they’d love to have a 'beach base camp' in some tropical paradise for softer adventures on shorter getaways. Some even confessed they just wanted a place to spend a few months during the cold Canuck (or Yankee) winter doing a little 'telecommuting' on a rooftop terrace overlooking a warm sea and sipping a margarita!;-). After scouring the coasts of Mexico and Central America for the perfect ‘nearby’ spot (compared to, say, the Kathmandu Guest House! 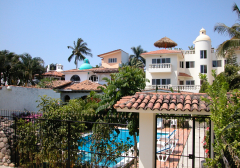 ), we’re happy to introduce “Aventura Pacifico” (in honor of our Pacific Adventures over the years), a lovely little retreat for intrepid sun and/or adventure seekers. Whether you want to spend the whole day relaxing on the beach or by the pool reading a book, or go zip-lining, whale-watching and surfing every day of your stay, the choice is yours in beautiful Bucerias. 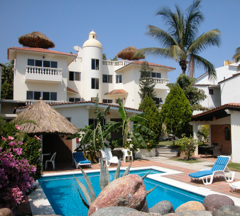 The Aventura Pacifico accommodations are in an ideal location, safe but with plenty of local charm, in a genuine Mexican fishing town of great character. The suites are comfortable and efficient, while not being confined to a huge 'all-inclusive' resort in a gated community where tourists are kept in an isolated bubble! With this project, we aren’t catering to those who expect to live in the lap of luxury (for our friends and customers with caviar tastes and budgets we recommend the Four Seasons or the St. Regis, just a few minutes up the coast), but we are certain most travellers will be pleasantly surprised by the authentically Mexican and somewhat “rustico” appeal of the lovely Aventura Pacifico! 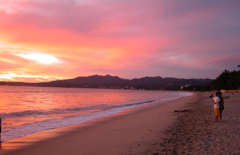 We urge you to venture south to beautiful, tropical Pacific Mexico and enjoy! Address Note: If searching for our location online, please note that we are on the street known as calle Francisco I. Madero (sur) (i.e. SOUTH), in the Colonia Dorada (Golden Zone), as there is another Francisco I. Madero street in northeastern Bucerias. If you are having trouble locating us in an online mapping service, you can usually paste our GPS coordinates directly into services such as Google, exactly as follows 20°44'57.74"N 105°19'43.30"W , and come up with our exact location. When providing directions to taxi drivers, etc., you can also mention that we are right next to the very well-known Decameron resort, on the beach/ocean side of Highway 200. Get a handy map to print out for taxi drivers by clicking here: Directions to Aventura Pacifico.